To begin publishing from WordPress please contact us to request an API key and enable WordPress publishing on your account. 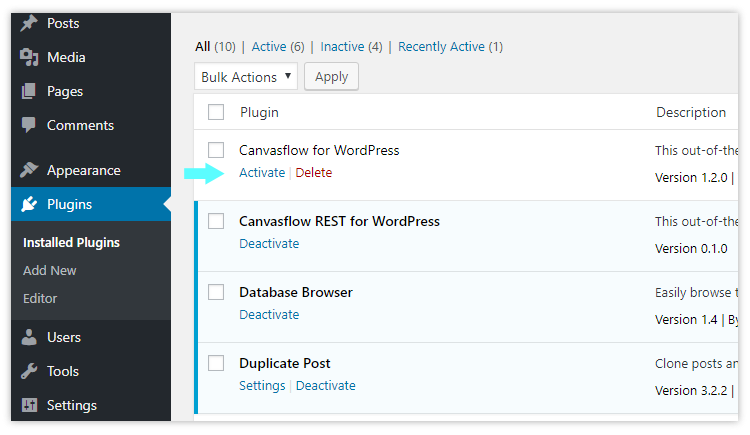 To get started, follow the steps outlined below to set up your WordPress instance and Canvasflow account. The publish widget enables content to be published from within the editor to fit seamlessly into your workflow. 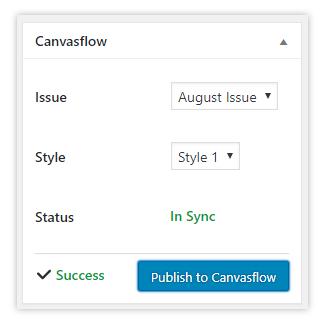 Simply select a Style (or leave as default) and select ‘ Publish to Canvasflow’. If you are connected to an Issue-based publication or a Twixl Publisher channel which makes use of ‘Collections’, the option to publish to a specific Collection or Issue will also appear as an optional menu option. Should for any reason the post fail to publish an 'Error' message will appear. If an error message is displayed, it's advised to check your plugin settings to ensure the correct API key and publication has been selected. Please contact our support team if you have problems when attempting to publish article content. This is where you'll find a list of all content items that exist in your WordPress instance. 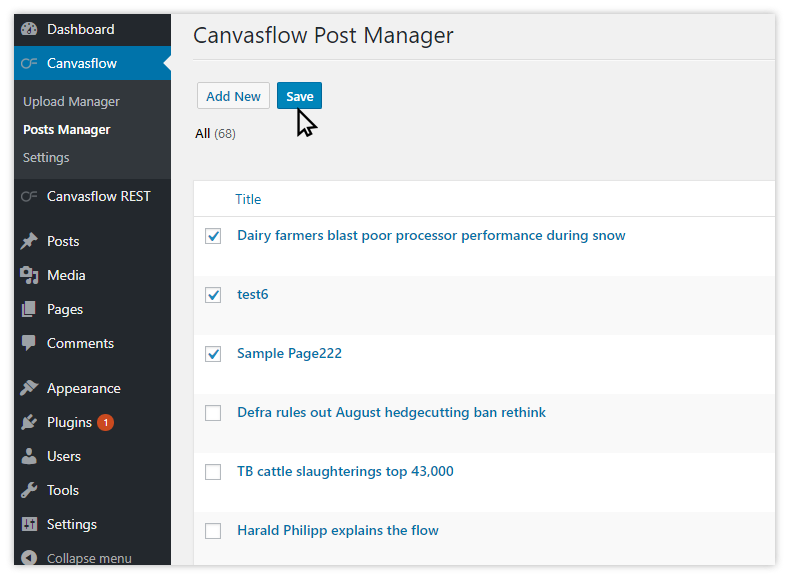 This list consist of posts, pages and other eligible content types (see custom post types) that can be published to Canvasflow. 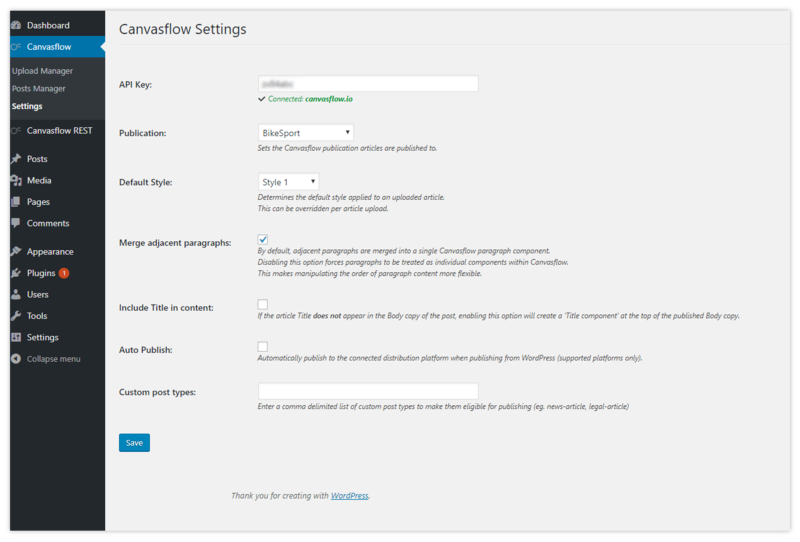 Upload / Update - Uploads the article to Canvasflow. This button can take several different forms which indicate the current status of the article. Orange - An article that has previously been uploaded to Canvasflow but whose content has been changed will display an 'orange' upload icon, indicating it is out of sync with your Canvasflow publication. Click publish to update the article content. 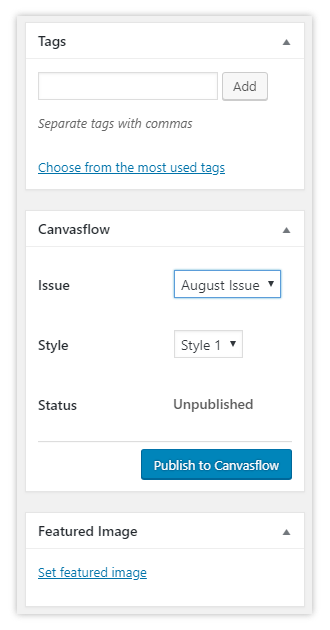 Now configure the HTML to Canvasflow connector.